Gone are the days when kitchen cabinets were basic and boring. Today there's a kitchen cabinet to fit everyone's style, regardless of price range. They come in a range of materials, including melamine and wood veneers as well as solid oak, maple, birch, and cherry. Cabinets can be ordered with a natural finish or can be given a darker or lighter finish. Depending upon your decor, cabinets can also be finished with color glazes such as red, white, and green. Kitchen cabinets can be made to complement any architectural style. They may be modern and streamlined with little detail and slick hardware, or they may have an "Old World" ethnic flavor, with ornately painted surfaces and hand carved embellishments. Cabinet doors can be formally styled with traditional raised panels, or they can be homey, white beadboard. Glass doors are a nice choice which enables you to exhibit beautiful dishes and china. Glass doors are also available with stained glass, beveled glass, or arts and crafts panels. Many of these cabinets are lit from the interior for added effect. Very often a kitchen's cabinet style reflects the architecture of the house where they're installed. This generally helps resale value should you sell the house later. The styles listed below represent some of the more popular choices available. Traditional style cabinets usually follow designs used in the 18th and 19th centuries. The style is often formal and looks like finely crafted furniture. Hardwood is generally used and may be either stained dark or painted white. Cathedral arch raised panel doors, and decorative or crown moldings are common. Hardware and fittings often are polished brass. Glass doors used to display china may be divided by traditional style muntins. 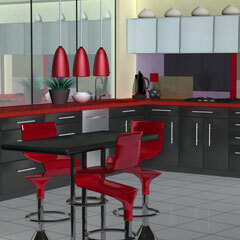 Contemporary style kitchen cabinets usually have clean architectural lines. The cabinets may be constructed of wood, stainless steel, or glass as well as chrome or high-pressure laminates. 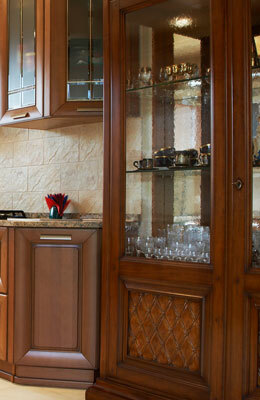 Flush doors and streamlined surfaces keep the cabinets sleek. 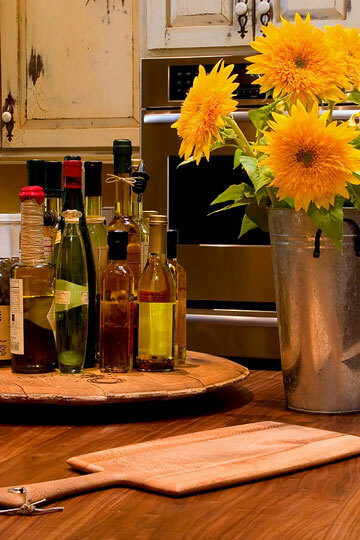 Country style kitchen cabinets have simple lines and a casual look and feel. A plain wood cabinet might be painted or stained and the finish may be designedly distressed. Finishes on cabinets in the same room might vary. The door style may be framed with a raised panel or beadboard insert, or the door may be totally omitted. Door knobs and drawer pulls might be whimsical and mismatched. Provencal cabinets are French country style. 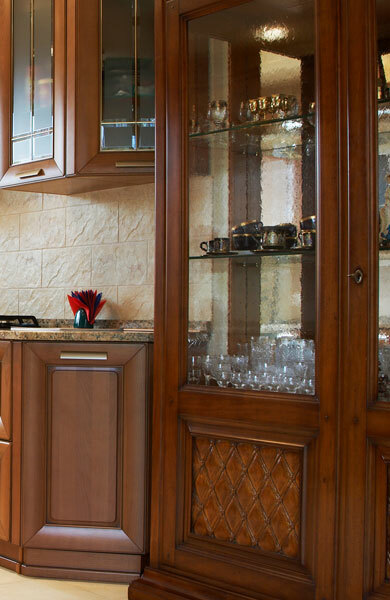 Cabinetry may look like unfitted cupboards and exude an "Old World" French ambience. Ornamental millwork, furniture feet, and pediments fit this cabinet style. Cabinets might surround a range to create the appearance of a fireplace hearth. Cottage style cabinets often feature a mix of finishes that look distressed or aged. Glass doors, plate racks, and display shelves make the cabinets fit this style. These kitchen cabinets should give the room a cozy and casual atmosphere. Shaker style cabinets use simple lines and plain paneled doors. The doors may be inset into the cabinet frame. These cabinets suit more traditional style homes as well as contemporary spaces because of their conservative appearance. Dyes and oils are traditionally used on Shaker cabinets instead of varnishes. Arts and crafts style cabinets might be plain oak with Mission-style hardware. Lines of these cabinets are clean and bold. Glass doors are common on arts and crafts kitchen cabinets. Trim is most likely squared off rather than rounded. This cabinet style presents an earthy, natural tone. Rustic style cabinets are often made of knotty pine with simple detailing and strap hinge hardware. This style is often found in hunting lodges, lake cottages, and backwoods cabins. Birch bark trim, woodsy tables and chairs, linoleum floor tiles, and buffalo plaid seat cushions fit this style to a "T"!